Hey, everybody. It’s Echo, welcome back to Echoia. 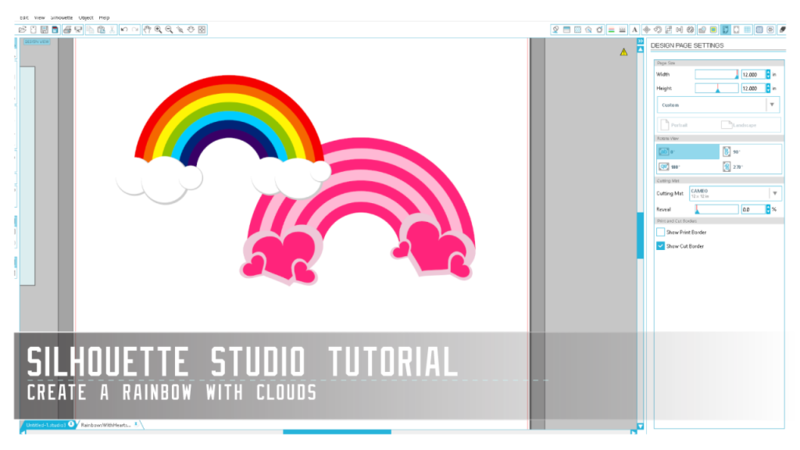 In this video I’m going to show you how to create a cute little rainbow illustration in Silhouette Studio. The first thing we’re gonna do is grab our ellipse tool and draw an ellipse. Hold down ctrl+shift* so it makes a perfect circle coming out of my central point. When I have my ellipse about the size I want I’m going to go into the scale tool and make sure ‘Lock Aspect’ is clicked. Make it 8″. I’m gonna go to the line color tool and give it no line color and go to the fill color window and make it red. Now I’m gonna hold the CTRL button and press C for copy and F for paste in front. Fill this with orange, go to my scale window and make this 7 1/2″. Now to make it go a little faster I’m going to grab both, CTRL+C, CTRL+F again, grab a corner, hold ALT+ Shift so it scales down to the center, we want the outside to be seven inches wide. And the next one we’re gonna make 6.5″. Again, I’m going to select all of them, CTRL+C, CTRL+F, Scale it down, ALT+Shift. We want the outside circle to be 6″. The one just inside that one we want 5.5″. Each of these is a half inch smaller than the circle before it. Now that we have enough circles to make our window we’re going to go to the third one, go to fill color, make it yellow. Make the next one green, then blue, indigo, violet, and the center most one white. Select them all again, go to the align window, center them all in case any got nudged in the process. Click and drag to select all except the white circle, group them. Now create a rectangle 4″ high (half the height of our outermost circle), click and drag to select the rectangle and our rainbow group, align window and align to bottom. Make sure that your rectangle is higher up than the rainbow group or you’ll move the rainbow out of place. Make sure your rectangle is wider than your rainbow. Select both the white circle and your rectangle and weld them. Now with that shape selected hold shift and click the rainbow group to have both selected. Go to Object> Modify> Subtract and you have a rainbow! To make our little clouds we’re going back to the ellipse tool. Hold alt and drag to make your circle, fill light grey and no line color. CTRL+C, CTRL+F fill this new circle with white. Select a corner of your bounding box and scale the white circle so that the grey ‘shadow’ circle shows up. Select both, CTRL+C, CTRL+V, move each new cloud piece around to your liking. Duplicate all of the cloud pieces by CTRL+C, CTRL+V, move the new cloud to the other side of your rainbow and adjust it so that it doesn’t necessarily look identical to your other cloud cluster. In your cut settings make sure you have chosen ‘Cut Edge’ if you are planning to print and cut (stickers, printable vinyl etc). If you’d like a personalized rainbow, feel free to ungroup and recolor each semicricle to your liking! I hope this tutorial was helpful. Thank you so much for watching, I will talk to you next time.